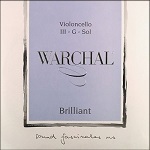 core strings that produce a warm tone quality with good bow response. The special core design and reduced tension creates strings that are very easy to play, especially for younger, developing players. 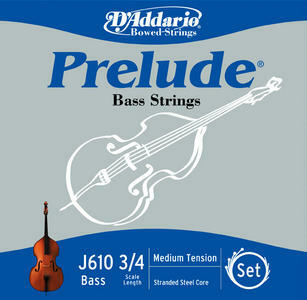 Ideal for use in educational environments, Prelude bass strings maintain a clear, warm sound that blends well across the ensemble. 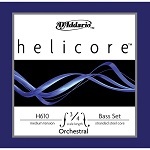 Helicore Pizzicato bass strings are multi-stranded steel core strings that produce a brighter tone quality than the rest of the Helicore bass line. The core design makes for strings that are very easy to play under the left hand. Damping is reduced to create maximum sustain and "growl". 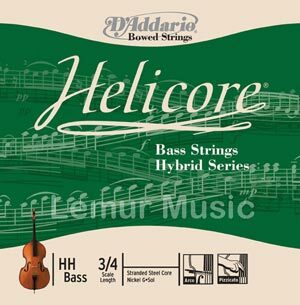 Helicore Solo bass strings are tension-adjusted specifically for A-E-B-F# scordatura solo tuning, one whole-step higher than standard tuning. They are multi-stranded steel core strings that produce a warm tone quality with excellent bow response. The core design makes for strings that are very easy to play under the left hand. 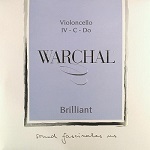 Damping is optimized for arco use, making them ideal for solo performance.